Let’s face it. 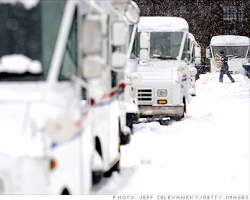 The United States Postal Service as we know it is soon to be a thing of the past. Despite holiday cards and Netflix subscriptions, the mail is just another service that is struggling to adapt to changing times. When you can create a wedding video or send out emails, why would you send out snail mail invitations? Why would you bother with snail mail anything? This is one of the many reasons why the post office will lose $238 billion dollars over the next 10 years, if not more. Cutting out Saturday delivery and increasing the cost of stamps yet again isn’t going to bridge that gap. Cutting services is good, but cutting out excess employees is better. There will always be someone delivering mail to your house, thought it might not be the USPS. Maybe FedEx or UPS (maybe even Netflix!) should buy the postal service and make the sweeping changes the aging organization needs. The simple step of privatization alone would help the organization survive.